Kids, Cows and Grass: Please, call me "Mom"
Everybody gets their 15 minutes of fame...I think I just had mine! 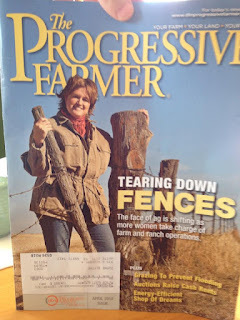 My picture was on the cover of the April Progressive Farmer magazine in support of an article about women in agriculture. As this picture was taken, my brother in law was driving by sounding the horn on his pickup and waving...keeping me grounded! 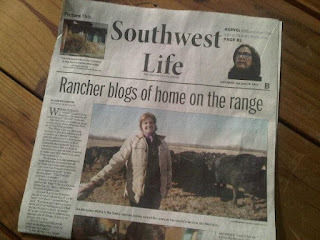 I've been honored to have been featured in some articles and stories recently, spotlighting my blog and the work I do on the ranch. To me, the funny thing is that I'm not special!! There are many women out here doing the same thing--and many more women working in other jobs doing what I'm doing--trying to raise my family in a safe, healthy community. So, just call me "Mom!" In the past few years, ranchers have realized that while they were busy feeding cattle, baling hay, and tagging baby calves people have been asking questions about how their food is raised...and we've ignored them. We have continued to get the work done, complaining that people are listening to activists about how food is made and getting the wrong idea. But until recently, we have done nothing about it. Unfortunately, that allowed many activist groups to get a food-hold and consumers are listening to them instead of asking the people who do the work. The good news is today there are more and more ranchers willing to connect with people who want to know where their beef is from and more and more questions are being answered by the people who really know! If you have a question that has anything to do with beef or raising cattle, please post it below! I will not shy away from the tough questions. If I don't know the answer, I'll find the right person for you who does. This is your chance to ask me anything! Please take advantage of it! Everyone who asks a question in the months of April or May will be eligible to win $20 of Beef Bucks that can be used in your local area to buy beef. So not only can you get your question answered, but you can win! Please be sure to post a link to your site or email address so that I can get in contact with you at the end of May. I have to close with one of the best comments ever about some of my latest publicity...notice on the top photo the teaser headline for the women in ag story states I'm "Tearing Down Fences." A friend asked "who rebuilds all those fences you keep tearing down?!" Luckily I have a fence-building crew of kids who do an awesome job!! are all the cattle that you raise on the ranch born there or do you buy from other ranches? I live in Florida and know calves are shipped from here to the west to mature for harvesting. Ellie, all our calves that we raise are local. Either they were born on our ranch, or to neighbors who buy bulls from us. We do buy 350 calves to raise as bred heifers. Many people do purchase calves from your area to raise in the Flint Hills of Kansas. That is called "backgrounding." They buy calves, grow them on our good native grass and then they go to feedlot in the late summer/early fall for the last 100-120 days. Love that cover photo and how perfect that you had horns grounding you at the time! hahaha, Janice! My brother-in-law may never let me forget it! Thanks for sharing. This is so inspiring to people who like me who consider themselves to be a woman in ag - yet still have a long ways to go! You are awesome! Don't forget to stop and smell the roses--even if they are wild roses that are growing next to a cow pie! Great post!! Educating consumers is very important and its always nice to put a face with where the food comes from. Thanks! It takes lots of us to answer all the questions! Linda, thanks for what you do! Keep telling your story!! What a wonderful post! As an Agriculture Business major in college, you are an inspiration to me to keep spreading the word about our industry. In college, I am constantly being questioned about where our food comes from and sometimes I can't answer them. But with ladies like you educating through articles and the internet my job becomes much easier! Thank you for spreading the word! Nicole, you are doing a great job blogging! Just keep being yourself and telling your story. And actively reach out to non-aggies. You are doing a great job. Remember that if your kids can't keep up with the fence mending, you can always call mine. Anglea, thanks for your support. I know your boys build a great fence--I enjoy driving around the countryside and seeing "Beavers Boys Fences!" Hahaha, Erica! Thanks for your kind words! !